Rapid developments in technology have continued to transform the healthcare delivery and its interactions amongst caregivers, patients, vendors, clinicians, vendors, payers and providers. One such area is Healthcare Information Technology (HIT) which offers practical, yet business-oriented solutions towards the regulatory and commercial issues that are faced by healthcare providers and IT vendors employing healthcare technology. In healthcare, medical information technology refers to the complete management of health information across the span of computerized systems and its highly secure exchange between providers, consumers, insurers, government, and other related entities. Today, healthcare information technology is a valuable tool that can be used to improve the overall productivity of your hospital. At Outsource2india, we are at the forefront of leveraging the best that modern medical information technology has to offer. We work with healthcare providers, hospitals, clinics, physicians, etc. to plan, evaluate, manage, and effectively implement health IT projects. Does your hospital have to deal with scores of medical data and make sense out of it? With our healthcare analytics services, we can help you decipher useful information out of a large amount of meaningless data. Armed with accurate information, you can make quick business decisions, increase the speed of your processes, and even identify new business ventures. If you have not yet invested on digitizing your medical and health records, now is the time to do so, with digitization becoming a regulatory requirement. 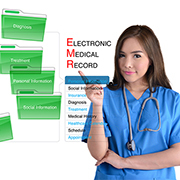 Through our electronic health records services, we can not only check and verify your manual data but also ensure that the data is completely accurate and secure. We will employ the best people for your project, and implement the best EHR system only after thoroughly understanding your existing business processes. Do you have obsolete IT installations that are unable to offer your patients with all the benefits that modern day healthcare software can offer? If yes, then what you need is a technology upgrade. At Outsource2india, our experts will understand your entire IT system and then adequately upgrade your IT infrastructure. This way you can leverage the best out your IT system while ensuring increased operational efficacy and satisfied employees and patients. Being a part of the healthcare industry, you will know the importance of information being exchanged in a proper and timely manner. At Outsource2india, we can help you digitize your data and develop effective communication channels across any type of computing platform, be it tablets, desktop, or mobile. This can be of great help to your physicians and provide them with patient information on a real-time basis. If you own a rural hospital, you may be facing logistics and infrastructural challenges while setting up health information systems. This is where we at Outsource2india can help you. After carrying out a meticulous assessment of your current setup and procedures, our team will install the best possible health information technology system for your healthcare institution while factoring in specific challenges such as available internet speeds, cabling, logistics, etc. As the owner of a large health ERP, you will need efficient 24/7 onsite IT support. At Outsource2india, we can provide you with a dedicated team of onsite IT programmers and administrators who will work as per your requirements on a 24/7 basis. This will ensure the continuous and uninterrupted functioning of your healthcare IT installation. Regular backup support and critical IT care are the other onsite IT services that we offer. Worrying about regular maintenance, breakdowns, bugs, and functionality lapses can take a toll on your employees and shift the focus away from your healthcare activities. However, we can help you with this problem by moving your health information technology online with a properly implemented SaaS solution, which will be managed by expert healthcare and IT personnel. If your hospital has decided to take the digital path, we will provide you with a team of data migration experts who will carefully read through your present manual documentation practices and then digitize your entire data in an error-free manner. We can take care of migrating data from a wide variety of systems such as Master Patient Index (MPI), Outpatient History (OP), Admitted Patient Care (APC), Inpatient Waiting List (IPWL), etc. At Outsource2india, we are not only experts at handling larger health information systems, but can also efficiently develop smart healthcare tools and mobile apps. Such smart tools can assist your patients, physicians, and users with access to fast information and interactions, thereby increasing productivity. Why Invest on Health Information Technology Services? Read our article which throws light on how the future of electronic health record will look like in 2020 and beyond. There is no one who understands health information technology better than us, as we have gained over 20 years of experience in offering professional healthcare services to global healthcare providers. Based upon your requirement, we also offer high-quality healthcare analytics and medical transcription services. In addition, we also provide Oncology EMR Services, EMR Services, Oncology EMR Services, EMR software development, medical call center services and more. By partnering with us, you stand to gain immediate access to an experienced team of healthcare experts and IT consultants who will adhere to our unique work methodology. Partner with us right away and enjoy an exponential increase in your ROI through our medical information technology services. Outsource health information technology services to us right now!